Not a week goes by without news about Twitter, the popular microblogging and social networking site. Things like how companies use Twitter for marketing, how consumers use it to flex their muscles, and how celebrities… well, use it to be celebrities. While Twitter has a huge user base, it isn’t the only microblogging service on the Web. One of Twitter’s competitors that you should pay attention to is identi.ca. It combines the best, and occasionally the worst, of the microblogging and open source worlds. It’s a young service, but one that’s built on a powerful and flexible platform. And in many ways identi.ca can give Twitter a run for its money. Pronounced identi-kah, identi.ca is the brainchild of StatusNet, a company based in Montreal, Canada. In just over a year of existence, identi.ca has become a magnet for refugees from Twitter, and has attracted a large following in the open source community. 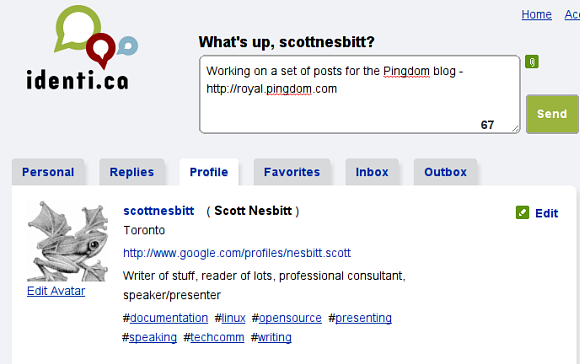 Like Twitter, identi.ca lets you send 140 character updates (called dents). You can follow the dents of other identi.ca users and interact with them in a number of ways – for example replying to their messages. As for the dents themselves… well, just like Twitter you do get some vacuous content and the occasional flame war. That makes it seem like identi.ca is just a Twitter clone, doesn’t it? But as you’ll see, it’s not. There are several ways indenti.ca differs from Twitter. First off, identi.ca is built on the OpenMicroBlogging specification. It’s an open source specification that enables microblogging sites to talk with each other. Anyone can start their own service using software that conforms to the OpenMicroBlogging specification. Private microblogging within the enterprise, anyone? Identi.ca packs a number of features that Twitter lacks. One of these is a built-in URL shortener. Remember, you only have 140 characters per message. If you’re posting a link to somewhere on the Web in addition to some text, it’s easy to go over the limit. If you’re using Twitter, you need to turn to a service like bit.ly or tr.im to compress the URL. Identi.ca does it automatically when you post a dent. You can also upload photos along with a dent. With Twitter, you need to (again) use an external service like TwitPic in order to include images in a post. The way in which identi.ca handles dents is very transparent. On Twitter, you have to log in to see your complete Twitter feed – your posts and the posts and replies of the people you follow. With identi.ca, it’s all out in the open. All you need to do is click on one of the tabs on your home page. For many, the biggest plus about identi.ca is that the service is federated. Remember that identi.ca is built on an open specification. That doesn’t just mean you can exchange posts between other microblogging sites supporting that specification; if you’re technically savvy, you can set up your own server – using open source software from StatusNet – and move all of your information from identi.ca on to that server. On top of that, you won’t lose your connections to other identi.ca users. This gives you a level of autonomy that proprietary services like Twitter lack. Compared to Twitter, identi.ca is a small fish. It doesn’t have a nearly as large a user base or the level of popularity and profile that Twitter has garnered. Twitter users can take advantage of a number of third-party services like Twaitter to schedule their tweets or Tweetake to backup posts. There’s nothing like that for identi.ca. The number of microblogging clients – software that lets you post from your desktop or phone – that support identi.ca is limited. That number, though, is steadily growing. Aside from the service’s unique features, there are two good reasons. One user said it best: identi.ca is more of a cause than a community. The goal of that cause is to remove the walls between microblogging services. You should be able to cross-pollinate feeds wherever you want to – whether to another open platform or to a closed one. The second reason is freedom. With identi.ca, you own your posts. As I mentioned a few paragraphs ago, you can set up your own microblogging server if identi.ca annoys you or you just get tired of it. It’s doubtful that identi.ca will knock Twitter from its perch. But identi.ca is a free, open alternative. For many people, free and open are concepts that are as important as features and functions. If you’re one of those people, then you definitely should give identi.ca a look. Do you use identi.ca? If so, feel free to share your impressions of it by leaving a comment. Wait. You mean people use actual websites and not clients to microblog? o.O Why? I have been using identi.ca for a while now, I found them when I decided to jump in to SMO, they have way less spam than twitter does but I didnt just stop at identi.ca, I went so far as to register with all social networking platforms with the same ID for branding purposes and Identity Control. This is something my competitors have not done so far and its been working out well. I have been maintaining them trough a series of service clients and now all I have to do is type once and my msg goes to 130 different social media websites. This is Independent Syndication. .Private microblogging within the enterprise, anyone? Why yes, i work at 100-130 employee company on the south shore of the island of Montreal with two branches in other countries and we use Identi.ca. Let me tell you hosting our own server was a BIG factor in this move. Being able to join others was a plus. I think openness in microblogging could stop it from becoming like the two extremes communications where on the one hand we have one large players, Skype, but then with no competition there is no choice and stagnation settles in or you have the IM world where if you want to chat with your friends online you have to register for a yahoo account, an ICQ account, an MSN account, a Googletalk account and so on (yahoo and msn actually communicate). Neither model serves the consumer well. And Mikes description of Evan is pretty spot on. Ive heard in speak once in person and quite a few times on podcasts like Linux Outlaws and he has excellent presence and personality on top of what he is saying.